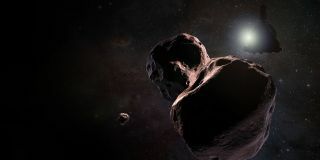 An artist's depiction of 2014 MU69, which New Horizons will flyby on Jan. 1, 2019. According to a NASA statement about the engine burn, it was successful and sped the spacecraft up by 4.6 mph (2.1 m/s). At the time, the spacecraft was about 3.95 billion miles (6.35 billion kilometers) away from Earth, temptingly close to its next destination. That target is a Kuiper Belt object called 2014 MU69 and nicknamed Ultima Thule, which is about 4.1 billion miles (6.6 billion kilometers) away from Earth. In mid-August, the spacecraft was able to take its first image of the object, and its images now help the spacecraft's trajectory team design the small path corrections that will help it reach its target. "Thanks to this maneuver, we're right down the middle of the pike and on time for the farthest exploration of worlds in history — more than a billion miles beyond Pluto," mission principal investigator Alan Stern, a planetary scientist at the Southwest Research Institute, said in the statement. "It almost sounds like science fiction, but it's not. Go New Horizons!" The flyby is currently scheduled for 12:33 a.m. ET on Jan. 1, 2019, which will still be Dec. 31 in the rest of the U.S. As the flyby approaches, that time estimate will be honed ever more precisely, an important step in ensuring the maneuver's success. "Since we are flying very fast and close to the surface of Ultima, approximately four times closer than the Pluto flyby in July 2015, the timing of the flyby must be very accurate," Derek Nelson, New Horizons optical navigation lead, said in the statement. "These first images give us confidence that Ultima is where we expected it to be, and the timing of the flyby will be accurate."